I have two childhood nightmares I still remember so vividly it’s as if I woke up terrified from them just this morning. One of them was inspired from spending an entire day with my aunt clearing garden beds and then adorning them with a rainbow of plants. The spiders, millipedes and beetles, I had squealed at as they crawled through the dirt I moved aside had somehow found their way into my dreams and were crawling all over my body and my bed. Even worse, when I woke, I looked down to my sheets which were patterned with dragonflies and butterflies in daylight. Without the sunshine filtering through my bedroom window, though, they resembled the insects of my bad dream. Recalling the nightmare, I can still feel my heart racing as it did that night as I screamed and flailed as I woke that night. Needless to say, I wasn’t a fan of creepy crawlies before the dream, and I’m still not too fond of six-legged creatures. So in July, when our home inspector informed me the house I was about to move into had an old termite infestation, I was faced with two choices. I could let the possibility of termites crawling beneath my feet consume my thoughts, or I could live in denial and believe my new home was perfect. I chose the latter. However, my husband, Aaron, chose the former and at least once a week would bring up how we needed to have the damage inspected for his peace of mind. But, between preparing to have a baby and then having a baby, we didn’t get around to having the damage inspected until January. It didn’t take the pest inspector long to arrive at his verdict on the damage to the joists in our basement — we didn’t have a termite infestation. It wasn’t all good news, though. The damage was indeed caused by insects, and ones only slightly less destructive than termites. We had powder post beetles. They don’t have the brand recognition associated with termites, but their damage can be just as bad as evidenced by the crumbling joists in my basement. As the name powder post suggests, the beetles turn posts (or in our case the joists holding up our main floor) into powder. Unlike termites who tunnel through lumber and leave excrement behind as evidence, the hallmark signs of powder post beetles are the powder dropped below their dwellings and the pinholes they bite into the wood as they find a place to lay their eggs. 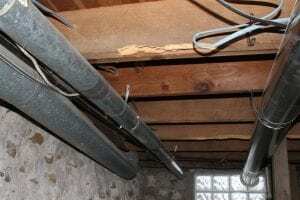 While the pest inspector was mostly sure the infestation was inactive, he still recommended treating the wood since he didn’t see the metallic sheen he said treatment typically leaves behind. Aaron, in all his paranoia, was more than eager to ease his anxiety of the potential problem and agreed to treatment. The inspector wasn’t done delivering the news about our bug problem, though. In addition to powder post beetles, we also have a “pretty severe” carpenter ant problem. During the summer, we had noticed dead winged, segmented insects on our basement window sills and scattered across the garage. We weren’t sure what they were, but they were dead thanks to Aaron bandaging our pest problem with a repellant spray with which he saturated the perimeter of our house. While Aaron’s solution was working for the moment, the pest inspector recommended we let the professionals evict the pests from our house and garage for once and for all. As a bonus, the treatment will ideally take care of our mouse problem as well, and hopefully, we’ll never again kill 14 mice in one week. Once again, our bank account suffers the collateral damage of the never-ending and always-increasing list of projects, but it’s worth it if I can ensure bugs crawling all over my house stay strictly figments of my subconscious’s imagination.